Brief Overview: Getting cut in line (which can be at school, in a playground, birthday party or at a play space) or having to hear “no”, when you as a friend if you can play with them politely are both examples of things that can make a child (or adult) feel angry. Every conflict in the story, is always backed up with something positive one can do to cope with the situation, such as breathing, counting to 10 or sharing your feelings with an adult you trust. 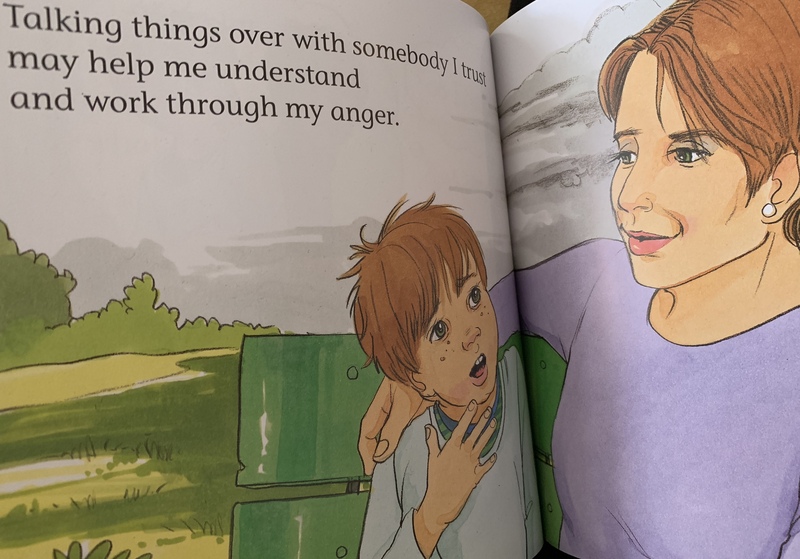 The author not only blatantly talk about how to rectify the problem, but takes the time to explain why it can be important for children to cool down and work though anger. She acknowledges that it is okay to feel how you feel m, even when it’s anger; but lets the reader know that there should be a way to work around it. Respect, saying sorry and forgiveness are all words in the story that gets elaborated on. Thoughts: Now that I’ve read through at least 4 of Cheri J. Meiner’s books in the Learning to Get Along Series, I can attest that every school, teacher, family and counselor should get the entire collection. The tips in all her stories (that I have read so far), can relate to children and adults alike. The informational how-to section for adults who are reading these to the children in their lives are at the end of each story and are excellent and easy to understand guidelines, broken down through page numbers, on how to elaborate in discussion with children. There are even activities families and classes can do together to better understand the concepts in the story. By the end of the story, the child and adult will fully understand and have a large compile of things one can do when dealing with anger. She includes breathing, journals, yoga, amongst other ways to cope with anger. The book is so well written that children who are reading the story, never finish reading the book feeling guilty in how they feel, angry or confused. She is respectful towards all in her stories and everyone will finish the book feeling empowered and positive! Furthermore, the images are clear and facial expressions are easy to understand and practice with children, to pinpoint how someone may be feeling. Just one page of any page in the story contains illustrations that can be a great point of discussion during a morning meeting, a confrontation or even during teacher’s professional development or for a parent- teacher conference. The language in which the story is written is not wordy at all, but just enough to keep kids engaged, not bored during the reading. 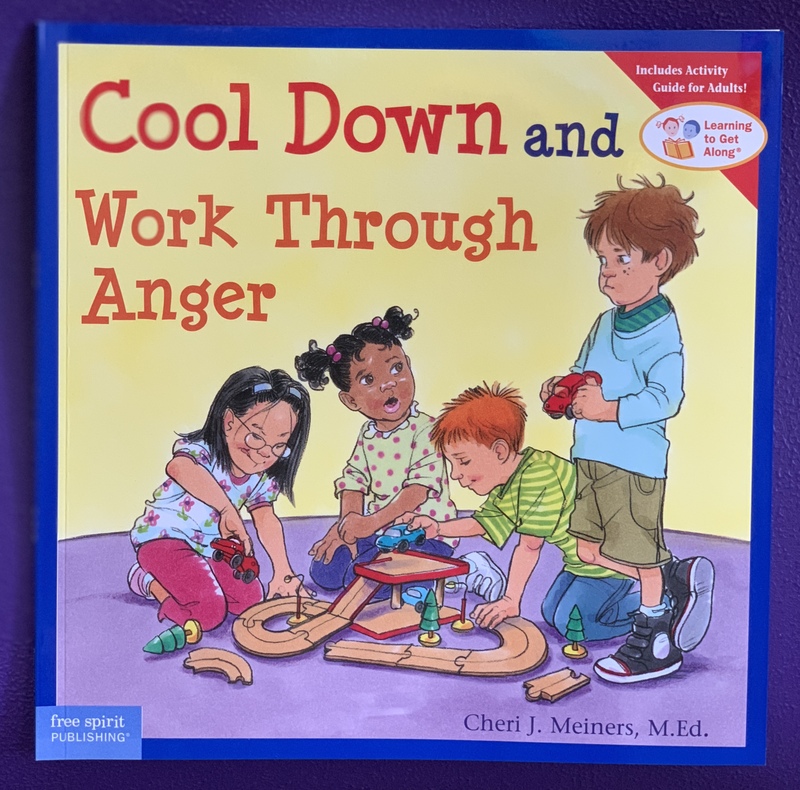 A must-read book for everyone, kids and adults alike that could use a little refresher on how to cool down and work though anger in a posit e way! Below are some awesome Cool-Down Strategies from Cool Down and Work Through Anger. Disclaimer: Hopscotch Mom is a proud participant in the Amazon Services LLC Associates Program, an affiliate advertising program designed to provide a means to earn fees by linking to Amazon.com and affiliated sites. I love Amazon and love sharing all things that inspire. By purchasing through my affiliate link(s), you are actually helping to support Hopscotch Mom! Thanks for all your support! Explore more of Free Spirit Publishing’s Resources here. There are an abundance of socio-emotional books for all grades! What are some ways you help others work through anger? 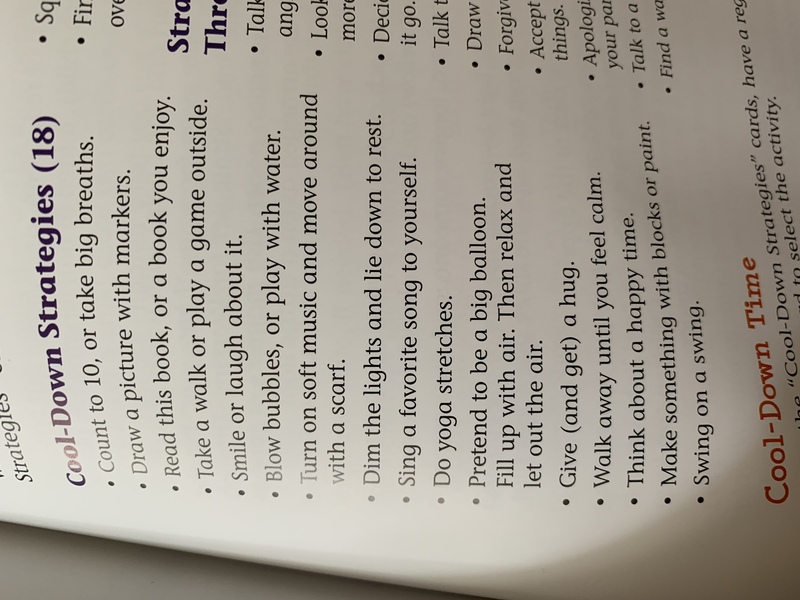 What are your own favorite ways to calm down? Previous Previous post: LEGO Play!